Framed film cell celebrates the 75th anniversary of The Wizard of Oz. Boasts 14 actual film cells from the movie! Classic images of all your favorite characters from the movie! Numbered limited edition of 1,750 pieces. Measures 19 1/2-inches wide x 19-inches tall. It doesn't get any better than this, Oz fans! Celebrate the 75th anniversary with this official limited edition collectible that contains classic images of all your favorite characters from the movie. 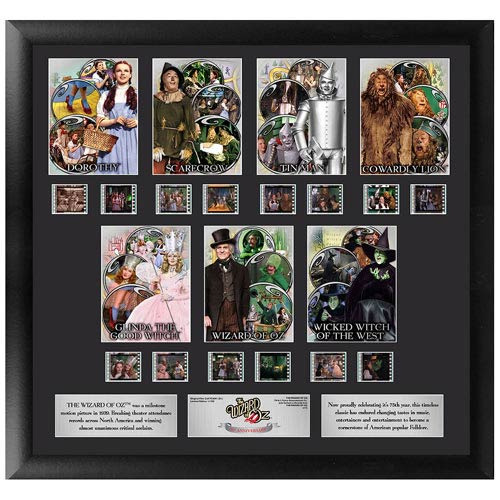 Measuring 19 1/2-inches wide x 19-inches tall, the black-framed Wizard of Oz 75th Anniversary Series 1 Montage Film Cell features 7 pieces of custom artwork, 14 different movie-still strips of actual film, and a numbered limited edition nameplate. Limited to just 1,750 pieces, it includes an embossed/foiled certificate of authenticity. Click your ruby slippers and bring one home today! Made in the USA. The Wizard of Oz was a milestone motion picture in 1939. Breaking theater attendance records across North America and winning almost unanimous critical acclaim. You can proudly celebrate the 75 years that this timeless classic has endured, through changing tastes in music, entertainers, and entertainment, to become a cornerstone of American popular folklore.